Heat oven to 375°F. Line 15x10x1-inch pan with foil. Place broiler pan rack or metal cooling rack in pan. Place diced tomatoes in blender or food processor. Cover; blend on high speed about 5 seconds or until tomatoes are still slightly chunky. In large bowl, mix beef and pork. Stir in tomatoes, marinara sauce, bread crumbs, egg, salt and pepper just until combined. Shape mixture into 9x5-inch loaf. Place loaf on rack in pan. Bake 1 hour. Top with cheese. Bake 15 minutes longer or until no longer pink in center and meat thermometer inserted in center of loaf reads 160°F. Let stand 5 minutes before serving. Garnish with plum tomatoes and basil. 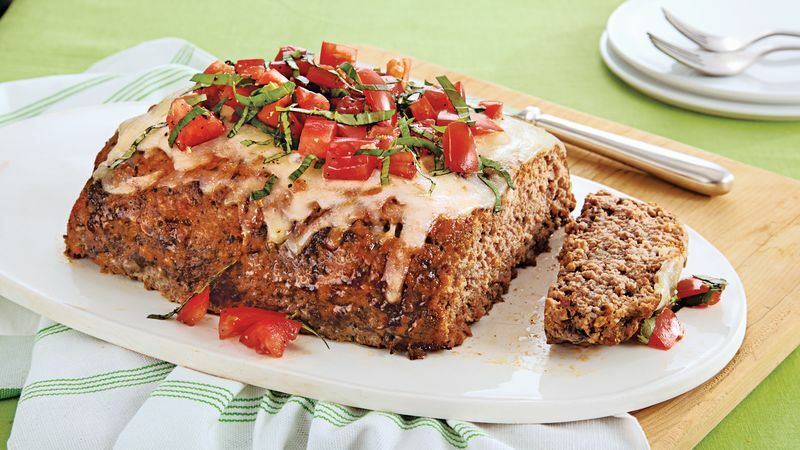 To Freeze: Make meatloaf as directed in Step 2. Wrap in plastic wrap and heavy-duty foil; freeze up to 2 months. Thaw in refrigerator overnight. Unwrap and bake as directed.